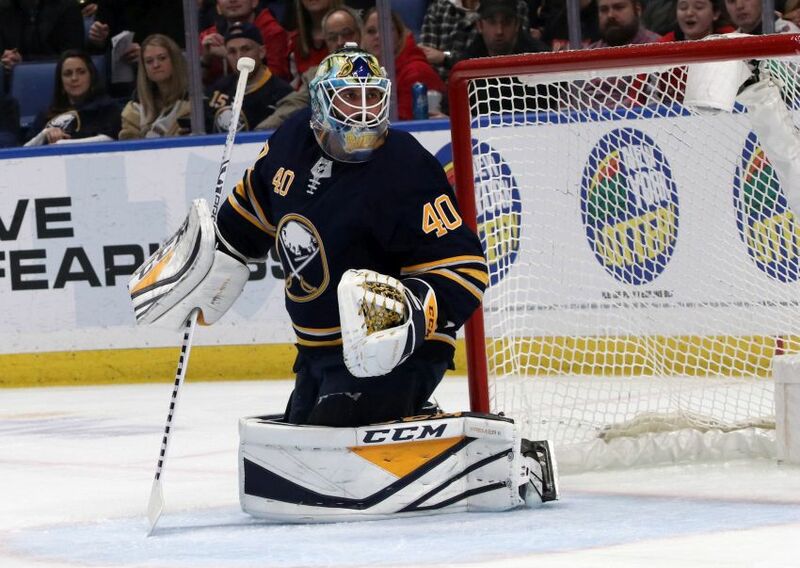 BUFFALO – Earlier this season, goalie Carter Hutton reacted to the Sabres’ struggles by trying to steal every game. Hutton, 33, quickly learned overcompensating wouldn’t work. Hutton has adapted this season. Having spent most of his six-year career backstopping established teams, he was used to operating within a more structured game. The Sabres, of course, often play loose defensively. So handling the bulk of their goaltending duties – he has played a career-high 44 times – has been a new and sometimes difficult experience. After enduring a rough stretch in which Linus Ullmark began outplaying him and earning more action, Hutton has started showcasing some of his early-season form. Hutton looked solid throughout Sunday afternoon’s 4-3 shootout win over his old team, the St. Louis Blues, making 30 saves. Given Ullmark’s recent struggles, Hutton might be the Sabres’ No. 1 goalie again over the final three weeks. In his last 11 outings, Hutton has compiled a 2.92 goals-against average and a .912 save percentage. In 11 appearances before that stretch, Hutton posted a 3.56/.889. Overall this year, Hutton has compiled a 17-20-5 record with a 2.88 goals-against average and a .910 save percentage. While the numbers don’t back it up, Hutton believes his game has been stronger this season than a year ago, when his 2.09 goals-against average and .931 save percentage both led the NHL. That standout season earned him a three-year, $8.25 million contract from the Sabres on July 1. Hutton roared out of the gate, winning 12 of his first 18 appearances. He won eight contests during the Sabres’ 10-game winning streak in November. But Hutton doesn’t believe wins, losses, goal-against average or save percentage truly illustrate how well a goalie has played. Still, Hutton said “everyone gets so worried about” stats.